Look At What the Wave Brought In -- Chicken, Prosciutto and Parmesan Cheese! Most kids love the beach. I was not one of those kids. To me, sand was a gritty annoyance that got everywhere. And the idea of swimming with other, strange creatures--creatures that were slimy or could bite--was less than charming. And then there was the weirdnesson the ocean floor... yeah, I wasn't feeling that either. Despite all of this, I distinctly recall one very special day at the beach. On that fateful day, two very important things happened to me. One: I learned never EVER open your mouth when a big wave is approaching as, despite my mom's claims to the contrary, the wave can and will dump salty water in your mouth. Ewww! And two: Aunt Dorothy made awesomely amazing and divine chicken. I'm sure the dish had a real name, but from that day forward, it was always known as "Aunt Dorothy's Chicken." What made this chicken so darned delicious? For one thing, it had the two Ps: Parmesan cheese and prosciutto. And then the rolled majesty was placed in a heavenly wine sauce. It was deliciousness on a plate! I must have talked about it nonstop, because my mom eventually got the recipe and made it for me on special occasions. Unfortunately, the recipe was lost somewhere along the lines (wahhhhhh!). Since the flavors were emblazened in my memories and taste buds, I was able to recreate my favorite chicken from childhood, and even added a few of my own special twists. So now I can make Aunt Dorothy's Chicken for myself on any occasion! Oh, and besides making some amazing chicken, Aunt Dorothy is an awesome woman! Pound the chicken to about 1/4 inch to 1/8 inch thickness. (Be careful to avoid rips and tears when you are pounding.) 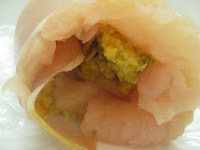 Mix eggs and eggs yolks, add grated parmesan cheese and breadcrumbs and mix into a loose paste. Lay a slice of prosciutto over each chicken breast. 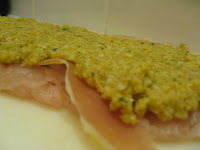 Spread about 2 to 3 tablespoons of egg-parm-breadcrumb paste over the prosciutto slices. 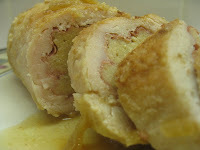 Placing the chicken the long way, roll the chicken jelly roll style. Using a large pan, heat olive oil and 2 tablespoons of butter over medium-high heat. 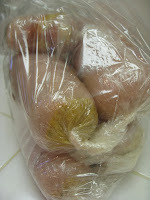 Remove chicken from refrigerator and carefully peel off the plastic wrap. 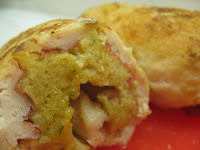 Gently roll chicken roulades in flour, dusting off excess flour. After the butter melts, add chicken. Let brown on each side. (This goes pretty quickly, so keep an eye on them.) When they are golden brown and lovely, turn off heat and add 1 cup of white wine to the pan. Cover loosely with aluminum foil and place in oven. Cook for about 20 minutes, until chicken is cooked through. While chicken is in oven, make the sauce. In a small sauce pan, melt 1 tablespoon of butter. Add diced shallots and cook until tender. Add remaining wine and stock, bring to boil and immediately reduce to a gentle simmer. When chicken comes out of the oven, add sauce to chicken pan. With a wooden spoon, scrape any lovely brown bits off the bottom of the pan. Serve with Jasmine rice. I love holidays. The small silly ones help break up routine and monotony, and the more significant days allow us to remember, commemorate and celebrate our traditions, culture and history. The glue for all of this? Food, of course! This week starts the holiday of Sukkot. During the holiday, we remember how our ancestors lived in temporary shelters as we wandered through the dessert and spend time in temporary dwellings aka tents aka sukkahs. Sukkahs are made of at least two and half walls and have ceilings made of branches or other material that allow a visitor to see the night sky. When the kids get a wee bit older, maybe we'll grab some materials from Home Depot and build a sukkah in the backyard. For now, we'll visit the neighborhood sukkah and choose a yummier option for our home--we'll build an edible sukkah! Break graham crackers apart into panels. 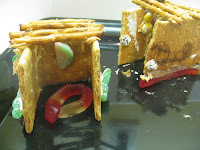 Using the sticky spread as a glue, have children affix a few candies to the wall panels. When they are satisfied, use the edible glue product as mortar and carefully put the panels together (the peanut butter seemed to work best for this). Place a dollop of "glue" on the pretzels and carefully place the pretzels on the top of the structure, creating the branch-like ceiling. Kids may want to place additional candies inside of their sukkahs. Use as a table centerpiece, and then enjoy! *Consider doing a savory version with crackers as the panels, cream cheese as the glue, breadsticks as the ceiling, and diced olives, celery, carrots and the like as the decorations. If you know me, you know I am a total fan of the musical Wicked. It really touches me on many levels. In it, there's a song called "For Good," which totally gets me every time. The heroines face each other for what could be their last time and admit that are blessed to have known each other: "I've heard it said that people come into our lives for a reason, bringing something we must learn..." I, too, have been blessed to meet people who have shared with me, taught me, and left their "handprint on my heart" (and sometimes my stomach, too!). Bibi was one of those ladies. She was kind, loving, funny, generous... she knew how important it was to express your creative side. She was a fabulous painter. And she made awesome challah! Challah is a traditional egg bread consumed during most Jewish holidays. It's eaten weekly for Shabbat, baked in a beautiful braid; for the New Year, we make them in a round shape. As a breadaholic, I have always had weak knees where challah and its sweet doughyness are concerned, and always dreamed of baking them from scratch for Shabbos. 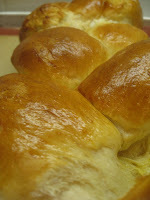 I have tried several challah recipes over the years, but none touched the majesty of what I recalled from my childhood. 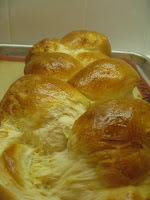 Some challahs were overly yellow inside--that just doesn't look/seem natural. Some were too fluffy and airy or dry instead of being moist, chewy and dense. While a few recipes came close to nirvana, all failed in one way or another. Then, one day, I was sitting at my aunt's house for dinner. Challah was passed around the table... I took a bite... and was in heaven! "Where did you get this?!" I asked. (Ok, demanded.) My aunt pointed to her long-time friend and fellow guest, Bibi. Like I said, Bibi was a very generous woman, so it didn't take much pleading and begging to get a copy of her recipe for scrumptious challah! Unfortunately, Bibi has since left this world--and way too early, in my opinion. I had always hoped to take her up on her offer for an in-person baking lesson, but it just didn't work out. Still, I make her challah often, and think of her every time I do. Her memory--and her challah--will continue to touch my heart and nourish my stomach and soul! In the bowl of a stand mixer* add oil, honey, egg and warm water. Add sugar, salt and 2 cups of bread flour. Add the yeast. Add remaining cup of bread flour. 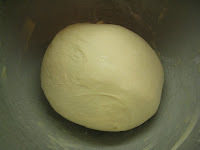 Roll dough in ball, place dough ball in a large bowl (I generally use the bowl of the mixer), cover with plastic wrap and let sit for at four to six hours. Remove your inflated dough and place on silpat. 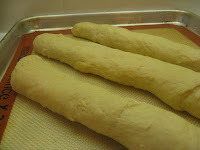 For braided challah, divide dough into three equal pieces. Roll between your hands or on the surface into long snakes and braid, pinching top and bottom. Spray one side of plastic wrap with nonstick cooking spray and cover braided dough for one hour. Meanwhile, heat oven to 400. When an hour has elapsed, brush the inflated braid with egg wash. Bake challah for 10 minutes. Cover with aluminum foil and bake for another 11 minutes, and then remove from oven. Slice (or rip a piece) and serve. As we say "downtown": Hamotzi lechem min ha-aretez, baby! * Don't have a mixer? No problem. Use the dough attachment of your food processor. No equipment? Really?? Gosh, people--go shopping! Of course, you can always mix and kneed the dough by hand.